When we got to Disneyland, we are always religious about bringing in our own food. With a family of 9, dining the Disney way would be so expensive. We do make sure we budget some money for our favorite treats and tasty eats. Here are our top choices that we feel are worth splurging for. These little beauties are so creative and fun, and never disappoint in the taste department. My boy got their braces off the day before we left for California, so these were their number one request. You can find them in a couple places through the park. I’ve seen them down by Winnie the Pooh and Splash Mountain in the gift shop, and also on Main Street. Sometimes you can even catch a glimpse of them making them through the window on Main Street. It is fascinating to watch them work! These are a close contender for me for first place. You can get it a few different ways. You can just have pineapple soft serve ice cream, a pineapple raspberry swirl, or (my favorite) pineapple frozen yogurt in a cupful of pineapple juice. It’s tropical, sweet, tart and very refreshing. You can find these by the entrance to the Tiki Room. The line is always super long. The best way to order these is on your phone through your Disney App. You just put in your order and you can walk up to the back window and pick them up with out a line. The Tiki Room lets you bring them in. It’s the perfect place for an afternoon treat when you’re up for a little rest after hitting the rides all morning. You can find these babies all over the park at different a la cart stations. These have been tradition since I was a kid, and it’s always nostalgic to eat one with my own children. We picked ours up while we were waiting to meet up with family on our way to ride “It’s a Small World.” Super tasty!! And a good way to sweeten up the members of your group that don’t appreciate Small World as much as you do. These were a favorite on the last day we were there and the ki5ds were getting tired of the snacks we’d brought into the park all week. We saw them several places, but enjoyed ours on our way to “Soarin’ Over the World” in Disney’s California Adventure Park. They’re great for tiding you over if you just need a little something but don’t quite want to stop to eat dinner. Churros were my 2 year old’s favorite treat and was even talking in his sleep about his sister stealing his churro (which was even more hilarious because she wasn’t even with him when he ate his!! Ha!). This is a huge treat for me because I usually only get this bread when we are in San Francisco. It is so fun that they have a bread tour in the Fisherman’s Wharf area of California Adventure where you can watch them make the bread and have a sample. I couldn’t resist this Mickey loaf. My kids couldn’t even wait to eat it until we got to the hotel. Everyone started tearing off pieces between rides. 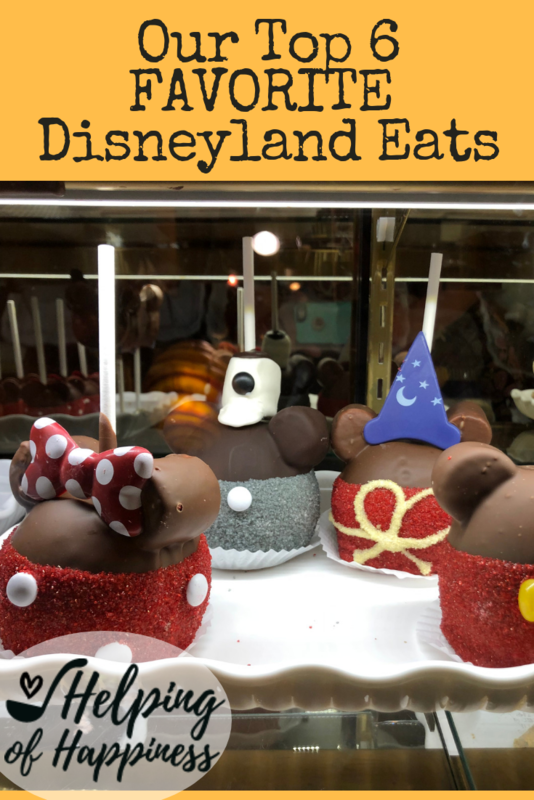 In California Adventure you can get clam chowder in the sourdough bread bowl, but we were in the French Quarter of Disneyland when we stumbled up on this new find at the French Market. I loved it even more!!! Take that delicious sour dough bread and fill it with the most wonderful sweet and salty soup. It’s so filling 3 of us could eat a bowl together. It was the best dinner, and I felt like I got a great bang for my buck, which doesn’t happen much in Disney. It was a chilly evening, and we were all so exhausted. We lapped this up and then snuggled together to watch the fireworks. It will be a Disney staple every trip from now on. I will probably dream of this at night. Now it’s your turn! 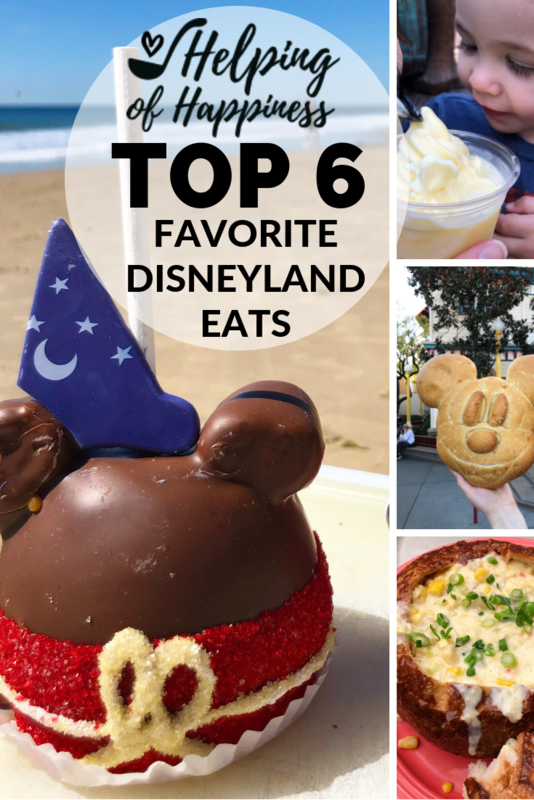 Tell us in the comments all your favorite Disney foods that we need to try next time we go! !